ArrPeeGeeZ: The Witcher 3 Walkthrough - Side Quests: Out On Your Arse! The Witcher 3 Walkthrough - Side Quests: Out On Your Arse! Note: You get an extra option to solve this quest peaceably if you visit Skellige and complete the quests there first. Not a huge issue, but worth noting. Fight one-on-one with the Skelliger leader. This involves a fistfight with the dude. Not too hard as long as you’re around his level. Fight the lot of ‘em. A group of Skelligers will attack. This is probably the hardest option, as the brothel is small and there’s not much room to fight. Remain nimble and sidestep constantly. Convince them to leave with Axii. You’ll need second or third level persuasiveness to get ‘em gone. 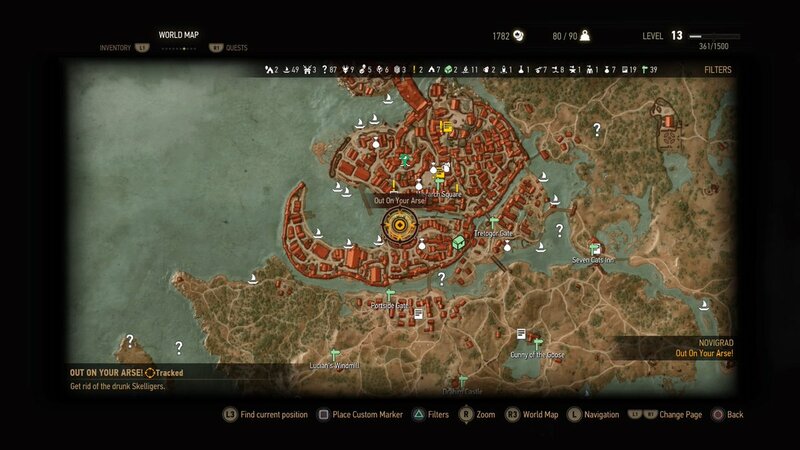 Assuming you’ve completed the quest The Lord of Undvik you can also just get the guys to leave by pointing out Geralt’s identity. Regardless of how you get rid of the Skelligers, speak to the Strumpet out front again for your reward. You can accept or refuse the reward, but (presumably because of a bug) you’ll get money either way.